Jitendra Shah of the Asian Development Bank (ADB) introduced the participants of the conference entitled Changing the Climate Towards Good Governance to the term ‘vampire energy’ - energy that is utilized by appliances and equipment because they continue to be plugged in even if they are not being used. At the event on 27 March 2012 at the newly opened Mind Museum, Shah said that 30% of the energy consumed is ‘vampire energy.’ “Just because you want the convenience of turning the television on with a clicker, you are spending 30-50% more energy,” alerted Shah. The conference acknowledged that climate change is the new normal and to adapt to it requires a change of mind set. Transformed behavior as an adaptive measure was also the focus of the top three pictures of the photo contest acCLICKmatize. A photo of a biker in between cars was the top choice. “It depicts modernity as the direction that we are all heading towards, and it does not have to be reversed to adapt to climate change. We can go back to the basics without altering the trajectory to a modern and comfortable life,” explain Dr. Neric Acosta, who was a member of the jury for acCLICKmatize. The other photo showed a child recycling a plastic bottle, which shows how behavioral change vis a vis the environment has to begin a young age. A picture of a constructive wetland along Pasig River ranked third. “The science to address climate change can be as simple as bio-mimicry or mimicking what are already the processes in nature,” said Acosta. 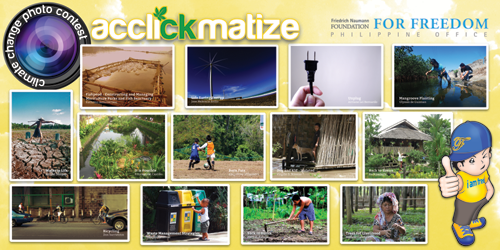 There was a total of 124 entries submitted to acCLICKmatize. The conference on climate change and acCLICKmatize were organized by the Friedrich Naumann Foundation for Freedom (FNF), a German liberal foundation.